Following on the heels of yesterday's gourmet posting, this is a good indication our children have crossed over...to the French side. After so much traveling and eating out, they develop an obsession with restaurants and decide to create one in our house: Restaurant Chez Simon Montpelier (named after a ghost in a favorite childhood book, Which Witch?). They create an elaborate menu that proves a high level of Frenchification and some serious innate foodieness. The girls actually make about 90% of the meal by themselves. And 250% of the mess. After a wonderful date night, facilitated by our daughters, Anthony and I rate the Restaurant Chez Simon Montpelier 4.5 stars. On the plus side, the ambiance is lovely, with pleasant music played not too loudly and a great view. The meal is delicious -- truly. And the price can't be beat, as there is no bill. However, we do have to withhold half a star since in lieu of payment, the guests have to help with the dangerous frying and, after the meal, do all of the dishes in a kitchen that looks like it has just been through a 6.8 earthquake. The service -- en français -- is like the friendliest, most adorable, but French-est waiters ever, complete with perfect accents, Gallic shoulder shrugs, and pouty lips. Though I must admit that the kids are total crap when it comes to opening a wine bottle. You're the one who's even greater! You're the one who's mighty fine! You can spend $600 a meal and still not walk away with a poem dedicated to you: priceless. Through this all, their cooking skills and possibly poem-writing skills are improving, but I am sad to report their kitchen cleaning skills are not. St. Félicien is made in the same style as a St. Marcellin, except that it's bigger, younger, sweeter, and mellower. It's still a creamy, delicious cheese, however, made from cow's milk -- raw or pasteurized. It was however, in its earliest days, when a dairy seller in Lyon invented it at the beginning of the 20th century, made out of goats' milk. It can be made anywhere in the country, but usually it comes from the Rhône or Isère. The name comes from St. Félicien square, on which was located the dairy shop where it was created with leftover milk added to some cream and turned into cheese. It's the kind of cheese that can be found in nearly every grocery store, and many cheese shops, at varying levels of quality. Today, the cows' milk is turned into soft curds, then drained and aged for at least 10 days, until the rind is a delicate yellowish-white and the texture is firm but still quite creamy. It can also be aged 20 days, for a bolder flavor and runnier texture, and around 4-6 weeks for even bolder and runnier still. 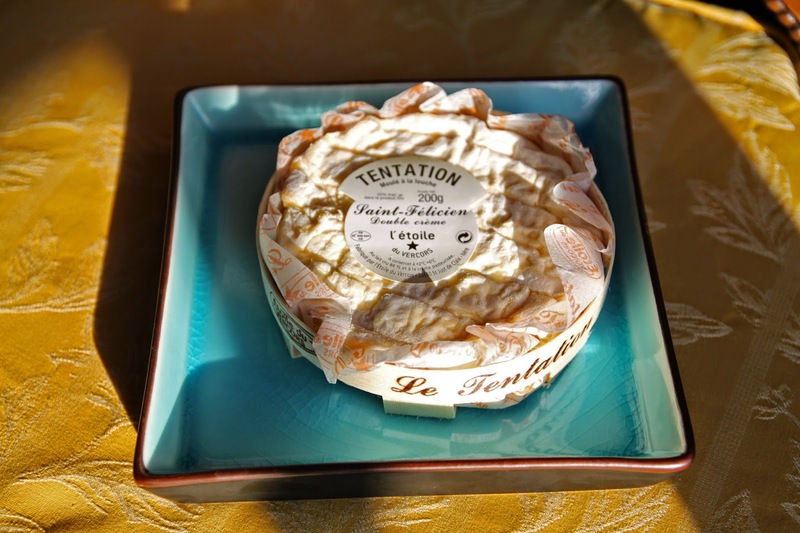 One reason I pair this cheese with this story is a mental connection with the name: we congratulate ("felicite", in French) the girls for a great meal. Also, this is a wonderfully kid-friendly -- yet still very gourmet, high-end -- cheese: creamy, oozy, salty, buttery, and flavorful without being too stinky, strong, or gamy. The girls have never served a cheese course at Restaurant Chez Simon Montpelier. I don't think they're brave enough to serve me one yet, but they should be; they have excellent taste in cheese and adore Saint Félicien.